Hello! I'm happy to be hopping along with a bunch of AMAZING artists today, to celebrate the launch of the 2016 Catalog products in the Hero Arts store. 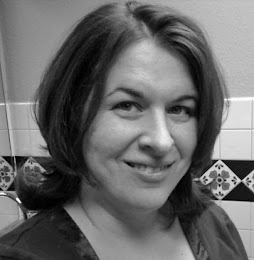 You should have made your way here from Tami's blog. I have the full list of hoppers down below, as well as info about a giveaway! Today I'm playing with one of my favorite new dies in this release - the Paper Layering Mum Flower. I made two cards for today's post. First, I cut the flower from vellum. Hero Arts has a new line of Bold Inks - these are hybrid inks (a blend of dye and pigment), and they dry quickly and are permanent on most surfaces - including vellum! I made a mask by cutting the flower again out of regular paper, and trimming to remove the inner bits of the flower. The ink was sponged onto the vellum, then a little gold stitching added to keep the panel in place. The message is from a new set of messages called Hello Gorgeous! - I love the fun and sometimes edgy sentiments in this set! 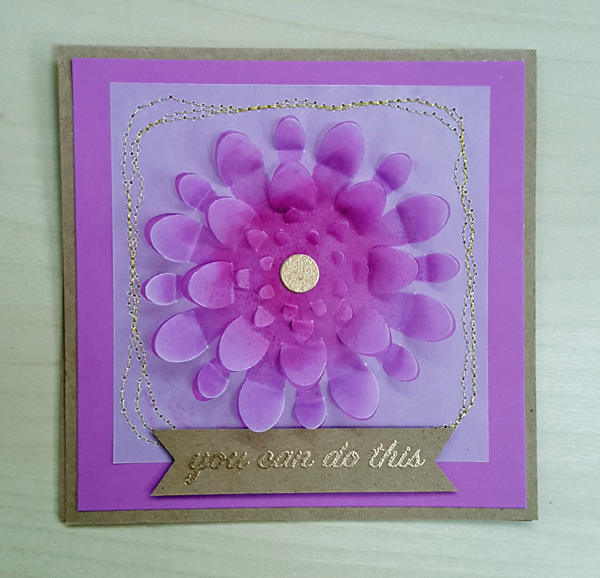 I embossed the "you can do this" message in Brass embossing powder - LOVE this color! Since I already had my Brass embossing powder out, I decided to go a little crazy and emboss an entire panel of cardstock with it, to use for cutting out another mum. The background for this card is a gorgeous new Bold Prints cling stamp called Foliage. I stamped it in new Orchid Bold Ink on vellum. The message for this one comes from another great new set called Dare to Dream - the sentiments in this one are a lot of "girl power" themes and I love it! I'm the final stop on this blog hop - I hope you've enjoyed all of the amazing inspiration! The list of bloggers is copied below - check them out if you haven't already! Hero Arts is giving away four $25 shopping sprees, drawn from comments left across all blogs in the hop. Comment by 11:59pm PT on Sunday, February 14, and they will announce the winner on the Hero Arts blog the following week. Hop along and comment on every blog for more chances to win! 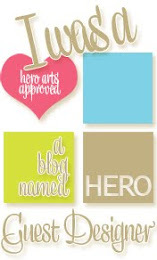 And be sure to visit the Hero Arts store to check out all of the new goodies!!! Those are gorgeous! I love the colors you used on the flower for the first one and the gold stitching looks great with it. The gold flower on the second one is just stunning - what a great idea to emboss the whole piece! Thank you for showing your craft. I really enjoy the stamping and stamping on vellum, it is definitely the new it. Thanks to you, I have started crafting with my family who are not crafters but they are eager to participate and learn. It is evident that you truly enjoy your love for everything paper, once again thank you for sharing. Love the new Dimension dies. Beautiful! Love the effect with the embossing powder! Love love the colours of the stamp pads!! Another fun die set!!! Such beautiful cards!! Such pretty cards! Love this floral die! Cool dies and very stunning new inks. Your cards are very nicely done. Thanks for sharing. OoOh! I love the embossed paper technique for the mum! Beautiful. What is this stamp set called? I like the new dies. And the new vibrant inks. Good job. This Hero Arts die is so creative and eye-catching. I love the way you've colored everything and the stamp you used for the greeting! Great card! Lovely cards, Libby. I really love the Orchid coloured hybrid ink. I'll have to add it to my wish list. WOW neat die set. Beautiful designed card...love the colors. Beautifully done! Love those wacky new sentiments, too! Wow, that flower looks amazing! Love the dimension on that crazy embossed flower! I really like the three dimensional look that can be achieved on a card like this. Very pretty! 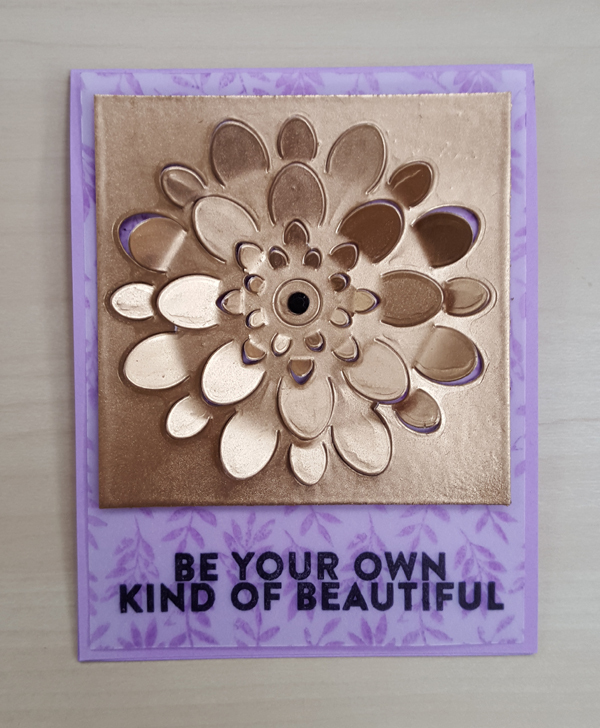 the Mum Flower die makes a beautiful card! I am really loving these dies. And colors. And sentiments. And flowers and fishes. And backgrounds! My brain is exploding, but I have loved them all! Thanks so much. Love your cards! The flowers are wonderful! The mum colored and cut on vellum is just beautiful! I appreciated the hint about cutting a mask before you colored. Thanks for sharing! Wow - your cards are just amazing!!! Wonderful inspiration from your cards!!! Libby, you have truly outdone yourself with these cards....they are absolutely stunning and I'm in love with that brass embossing powder! 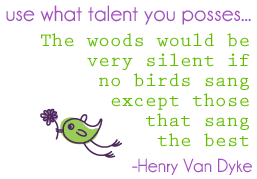 Thanks so much for the inspiration and it's so awesome for me to find some new talent! Looking forward to more of your creations! Thanks Hero Arts for the chance to win. Really nice. The new "3D" dies, like this one and the pineapple die, are fun. The new 3D dies are so interesting! Your square cards are quite striking. Wow!! These 3D dies are so cool!!! Love the colors you used!! Love the dimension & colors! I just love that gorgeous flower done in the brass embossing powder. Wicked cool! Sigh, this makes my heat embossing lovin' heart happy. Oh wow such beautiful creations!!! That die is awesome! Just fantastic, what a cool, cool card. Love how you used the layering flower. I especially like the vellum flower with gold accents and the orchid color is beautiful. That die looks fabulous with the foil cardtsock. The sentiments are all great. Very nice to see some new ideas. Thanks! Beautiful design - great bloghop. Thank you for such lovely inspiration. Your vellum card with the gold stitching is very pretty. Fun and unique cards! Thanks for sharing. Love your style and color choices. Fantastic cards! I love the new flower die, looks fabulous in gold! Your vellum flower is so pretty and that gold one is very striking! 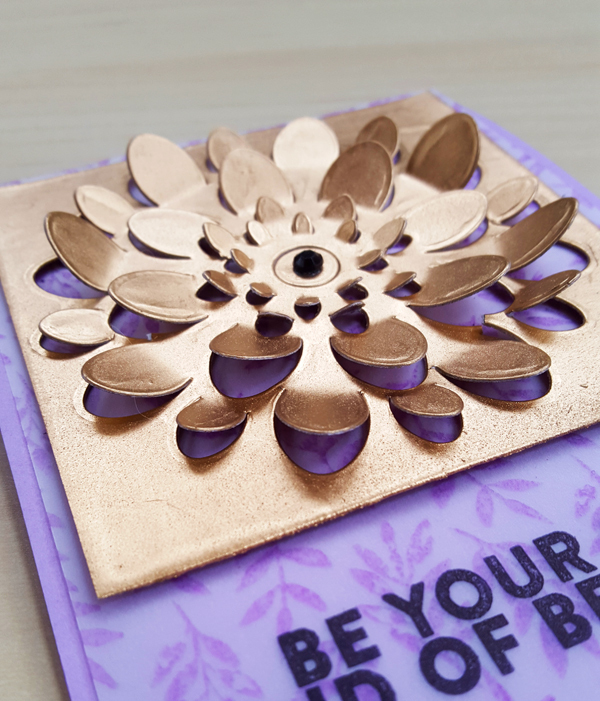 Oh my gosh, the bronze embossing powder with the stand up petals of the mum is gorgeous!!! I will have to try this! Wow! I just love that brass flower! Gorgeous pop up cards! Love your designs! Love that brass embossed paper you created. Real classy look. Very pretty cards and I love both of the stamp sets that you used!! Very pretty cards - love the new mum die! And, the hybrid ink is fabulous. More things to add to my wish list. Beautiful cards Libby! Love the stamp sets that you used! 2 great and very different looks thanks for sharing. Hi Libby, I enjoy seeing your work and these cards are super fun. I love the colors you used on the flower. Thanks for sharing. Wowo this flower die make stunning cards !!! Oh my goodness Libby, how PRETTY! TFS! OOOH, love how these dimensional flowers create such amazing cards. Especially love your GOLD floral card. WOW!!!! WOW! I do not know what else to say! Cheers. These are just beautiful, Libby! Love the colors and the pops of bling! This is so gorgeous! That die is really amazing and this was a great idea! So many things I like on your post... the gold and orchid color together just pop.... I love the partial die cut flower... and those sentiments! Love! Beautiful card. The gold just makes the color pop. Thanks for sharing. Oh! Wow! These cards are so cool! Love it! Love the layering dies. I have the heart one from last month and it makes a unique card. Beautiful. Like the 3d effect. The colors-the stitching, the flower. Just gorgeous. Such a stunning card--soft colors, great die & gold detailing. Beautifully done. Thanks for sharing. Oh my, NEED these new sentiment stamps and that flower die knocks me out. Just love your beautiful cards! The bold inks look just fabulous! Going on my wishlist for sure! So inspiring!! Thanks for sharing Libby! LOVE the brass embossing!! And the flower looks SO pretty cut from vellum!! Pretty cards I like the new bold ink. Wow, so pretty! I love the color combo! Amazing! I love the colors!! Bold inks for bold flowers! Love that sentiment stamp and the beautiful paper layering mum die. Wow, gorgeous cards with the bold inks, love all the variations! This is a beautiful die and the purple and gold are a lovely combination! What a fabulous card. 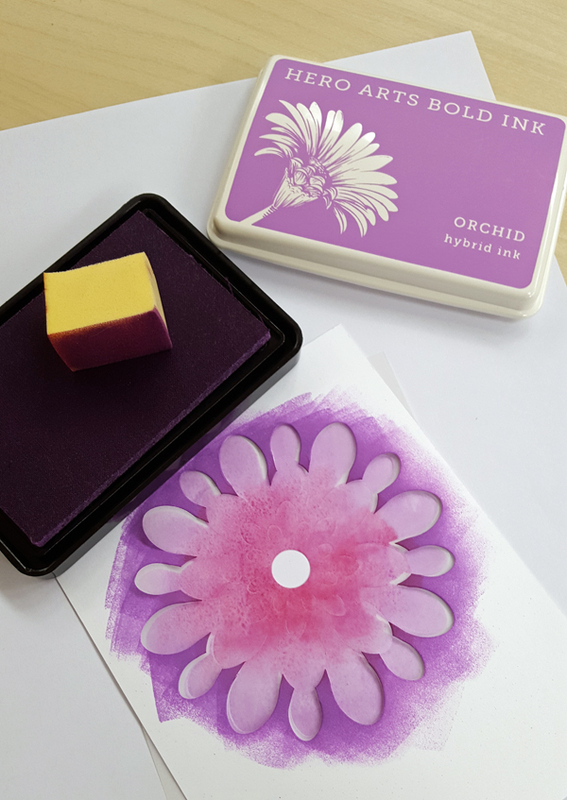 Love, love, love that orchid hybrid ink! Love the cards, especially the sentiments! Wow! Just WOW! 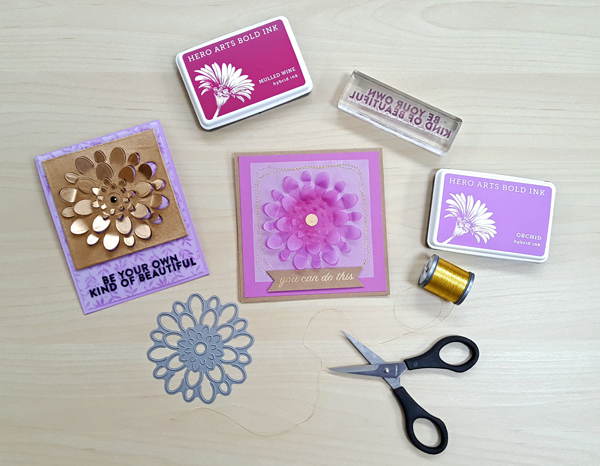 That gold flower is stunning, and the pretty purples on the other card are gorgeous, too! Love these cards! I love the paper layering dies! I love the purple and the flower die! A Beautiful die & even more beautiful cards!! Love the Brass embossing! Dare to Dream is wonderful! Love the colors. Best of all I love being able to see all of you on this blog hop show case the products. I would love them all but now must decide on only one of six on the must have list :-(. It took me 2 days but I am at the end of the blog hop. My legs are tired from all this hopping! LOL I have seen some amazing cards on all the blogs and yours are also amazing. Wow! I love the sentiment too although I wish they sold it with just that sentiment. I'm not sure if I would use all the ones in the package. Anyone want to go in it with me and we'll split up the stamps? LOL I had so much fun doing this hop and I can't wait to do another one. Thank you for the beautiful cards and the beautiful inspiration. I love them! These are amazing!!! Love what you did on the second card, I must try this! Love the color ink used in the card.what a amazing card. Thanks for the inspirations. 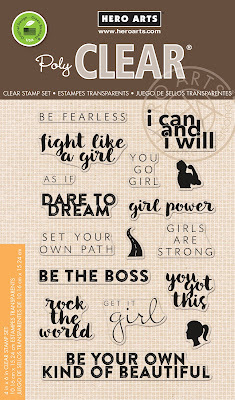 Love those sentiments stamp sets. Love to see the dies used, great inspiration! Beautiful! Love that purple and gold together! These cards are fabulous! I love the 3D effect this die creates. The colors are inspiring! Thank you so much for sharing these cards. The blog hop has been a blast! Gorgeous cards! I love the colors and texture the flowers add. Thanks for sharing. Love this popped up card--all your cards are so pretty! Both your cards are gorgeous but I love the purple one! So cute! Maaaaan, need to get to my craft room now!!! I'm amazed with your talents, Libby! Bravo! Wow Libby these cards are super powerful. The blossom itself is really the star of the show here and so impressed with how bold and vibrant the cards are both in color and design. Love all these inspiring sentiments! Your card is so elegant! Libby - so cool! 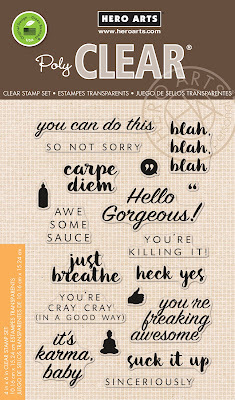 And I love that new stamp set, hello gorgeous too! Too funny! So much color and great techniques. Thanks! Whoa! These new dies are "cray cray". Like the layering, sparkle & so much more. Have a BEE-utiful day! Such beautiful colors! And I love the dimension of this die cut! Guess I have ANOTHER thing to purchase! lol Thanks for beautiful cards. Beautiful cards, love the bold colors. Very fun cards. The brass embossing powder is pretty against the new Orchid bold ink. 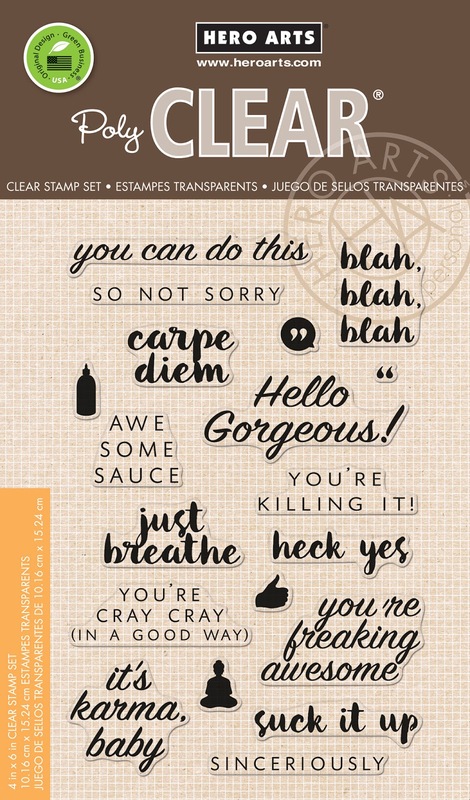 I also love the new Hello Gorgeous stamp set. It looks really versatile. Very inspiring ideas. I like the dimension the cards have. Beautiful and love the dimension. Thanks for sharing. Gorgeous cards. Love the mum die. Awesome cards & new release! Lovin' it! Thanks for the chance to win! Gorgeous cards! The new hybrid inks are definitely on my wish list - especially if they stamp well on vellum. So pretty! I love how the mum pops out on the page. Simply beautiful. Thanks so much! Great cards! Beautiful cards and I can see that I'll be buying some more ink. Gorgeous colors. Swoon, both of these designs are so wonderful, Libby! I adore the way that you embossed the mum, such a brilliant and beautiful idea! Loving all of the gold! Beautiful cards love the purple flower so pretty! I love the use of vellum on cards! Awesome! Aww, so pretty and girly. Pretty cards! Lvoe those dies. Love these new dies that give such great dimension!! You made such lovely cards using them. The dimension it gives is so cool. Love the colors and dimension on the purple card. It's really vibrant. Stunning cards. These dies are awesome. These are both so pretty! I love the metallic gold with that flower! WOW - what an EXCITING and BEAUTIFUL die - LOVE IT!!! Embossing the whole panel is a neat idea. The bronze and orchid ink are so pretty together. Thanks, Libby, for sharing your cards and techniques with us. What a fascinating die! These are new to me. I love the all-over embossing on the mum. Thanks again for sharing. Wow, Libby - just love your mum cards, especially the vellum one!! Very nice. What a great die. Super and cute mum card with paper layering touch. Nice technique and love the color ink. What a unique and fancy flower die! I love the modern look and the colors you used. Gorgeous cards! I love the colors & the way you used the completely embossed panel! Lovely cards. Really like the colors used! I love these dimensional dies! They really make the cards pop! Your lavender and gold color combo is really pretty too. Enjoyed your post & really like cut out part dies! Thank you! Fabulous use of vellum, and I love the bold colors. Amazing dies--love the layering. This is a must have! The colors of the stamps are great. Always interested in tips on working on vellum. Gorgeous cards. Lovely purple colored flowers. I love the gold too.